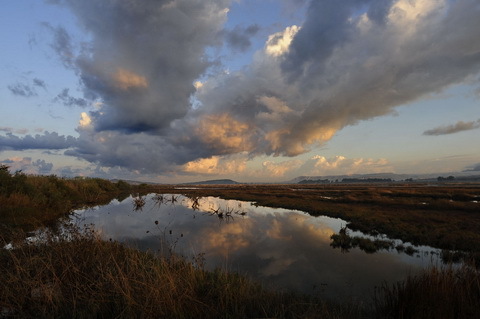 The wetlands of Gialova (Divari) are of particular ecological interest as a major stopover point for many migratory birds. Many rare species of birds such as herons and flamingos, ospreys, stilts, avocets, calidris, snipe, curlew, tartaric, terns, and the only chameleon found in Europe. The African chameleon changes colour depending on his mood and are an endangered species so please drive carefully and only park in designated areas. The wetlands are a protected area as among the many species found here there are several endangered birds as well the chameleons and the carretta carretta turtle. The main lagoon is mostly inundated by the sea. Thus salt resistant animal and plant life prevail and are preyed upon by certain species of fish and birds. It is a feeding place for ducks, coots, cormorants, ferns, herons, ospreys and flamingoes. The small town of Pylos was built on the southern shores of the Navarino Bay. 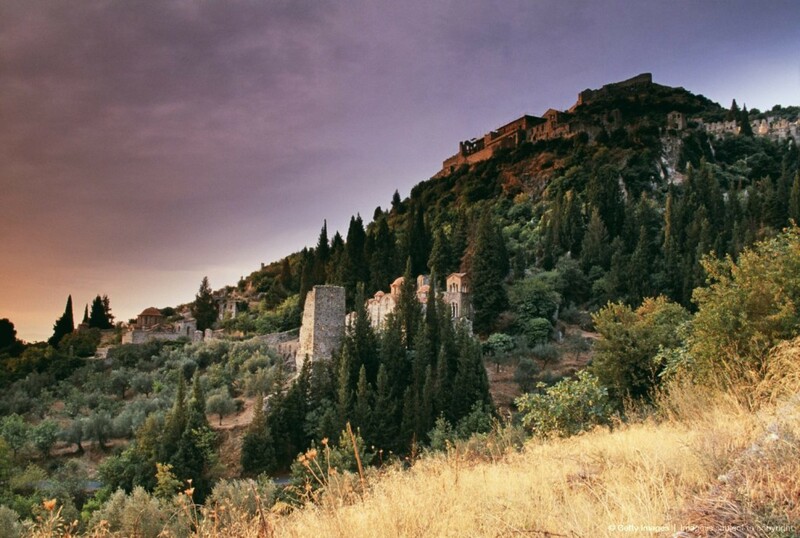 It has always been an important port of the western Peloponnese since at least the Middle Ages. Today it is a quiet town that becomes alive during the summer season when tourists and Athenians arrive to spend their holidays. 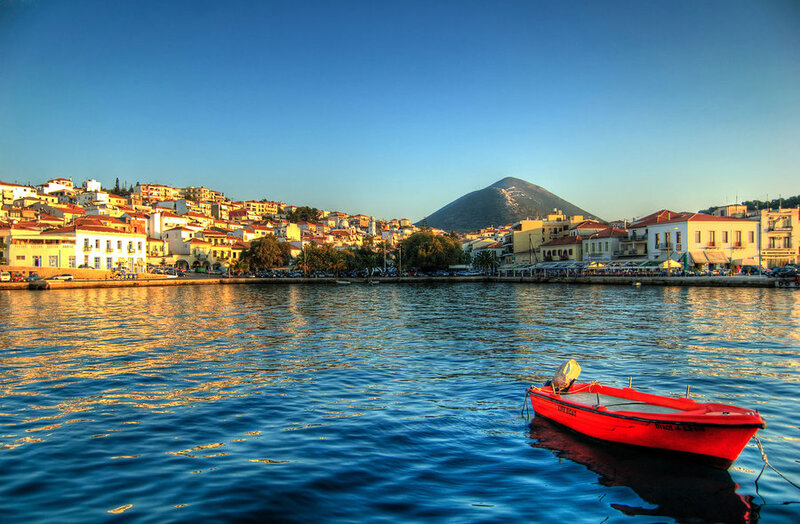 Pylos is a delightful town, with its waterfront tavernas and its beautiful central s quare which is surrounded by cafés and were you can have an “Ellenikós Káfe” in the shade of an enormous Plane tree. On the square you will also find a memorial commemorating the Battle of Navarino of 1827, in which the Turkish fleet was destroyed. The Neokastro or fortress is definitely worth a visit. It was built by the Turks in the 16th century, but during the last two centuries it served as a prison. You can have a walk around the battlements. Inside the Neokastro you will also find a beautiful church and a small museum. From the port you can make a boat-trip to the uninhabited island of Sfaktiria, just across the bay. Here you can see a small wooden Russian-orthodox church which was built as a memorial to the Russian sailors who fought in the Battle of Navarino. To the eye of the tourist used to famous Greek islands such as Mykonos and Santorini or to the region around Athens where the summer vegetation is low and dry, Gialova and its surroundings look surprisingly green. As a matter of fact, a lush Maquis vegetation grows all along the western coast of the Peloponnese, where in average it rains almost twice as much as in Athens or on the Cyclades. 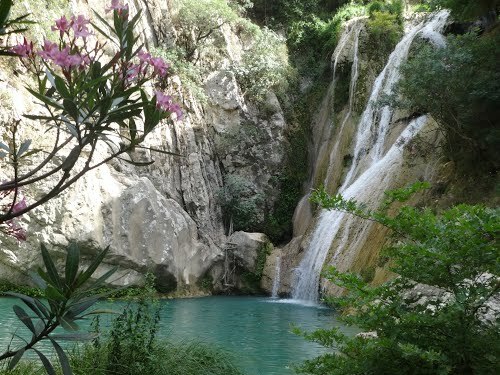 Many valleys cut through the hills covered by olive groves and natural vegetation around Gialova, and some of them hide wonderful waterfalls, such as the Kalamari waterfall by Schinolaka (the closest to Gialova), Polilimnio by Kazarma and the waterfall of Valta near Gargalianoi. All these waterfalls can be easily visited on foot along footpaths that have been purposely created. 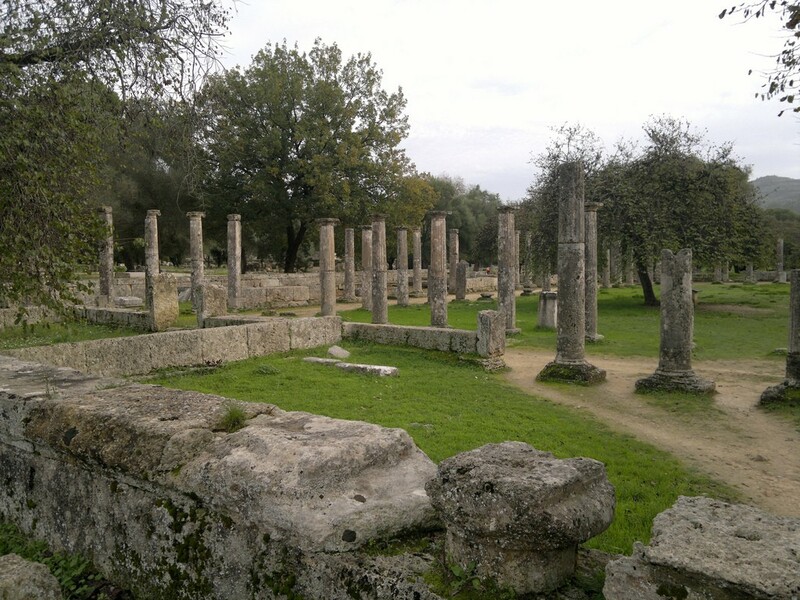 One of the largest and most beautiful archaeological sites in Greece, ancient Olympia deserves a lengthy visit. For over a thousand years the Panhellenic games – after which the modern Olympic games were modelled – were held at this site. Walk through the arched tunnel from the sanctuary into the stadium that could accommodate up to 20,000 spectators and you get an idea of what the athletes must have felt. The starting and finish lines are still there, so if you feel inclined you can give it a try. Imagine an amazingly intact Byzantine city, stuck against a steep hillside, with winding alleys, monumental gates and arches, medieval houses, palaces and churches, and you have a picture of Mystrás. Wander through Mystrás and you enter into a different age. In its heyday this Byzantine city had a population of more than 40,000 people. Mystrás was originally founded by the Franks in 1249, but they didn’t last much more than a decade and were eventually driven out by the Byzantines, who made it the cultural and intellectual centre of their world. Today Mystrás is an enormous open-air museum of medieval architecture and art. A number of churches house some of the most beautiful frescoes that you will ever lay your eyes upon. 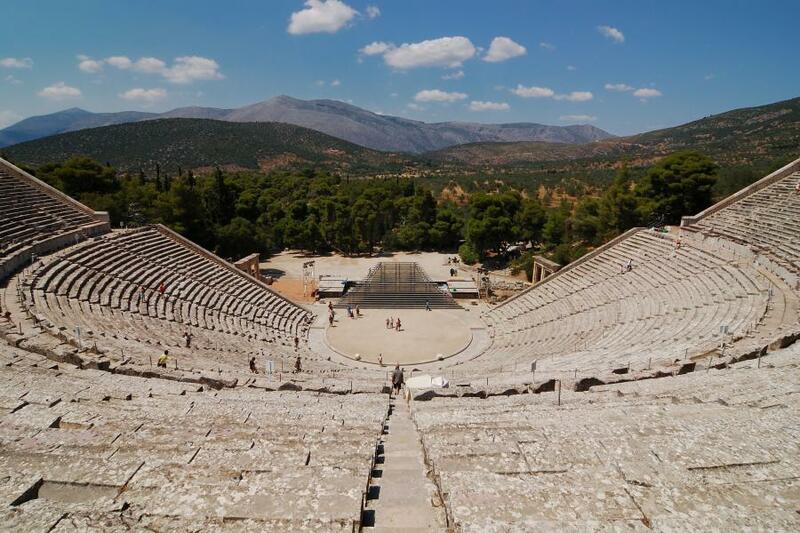 Epidaurus is one of the major archaeological sites in Greece, especially famous for its beautiful ancient theatre. The theatre was built by Polykleitos in the 4th century BC and thanks to its amazing acoustics it is still used for the staging of classical Greek drama during the summer. The theatre is part of the immense sanctuary of Asclepius (healing god and son of Apollo) and also incorporates a small but very interesting museum, which houses a collection of ancient surgical instruments.